If you want to change the world, start in your own backyard. "If you want to change the world, start in your own backyard"
When we look out the windows of our large sunny office filled with iMacs, pleather couches and marble floors ... we are reminded that this is not the Bay Area. We live in poverty. Our 48 employees fight to park their motorcycles in our small parking area because the public parking lot across the street has become a garbage dump. The garbage collectors go around from house to house on their bicycle carts (my home is only a block away so we are included) and then end up dumping it all across from our office to sort through it. Yes, they sort through every piece of dirty garbage hand by hand, often with their small kids helping. 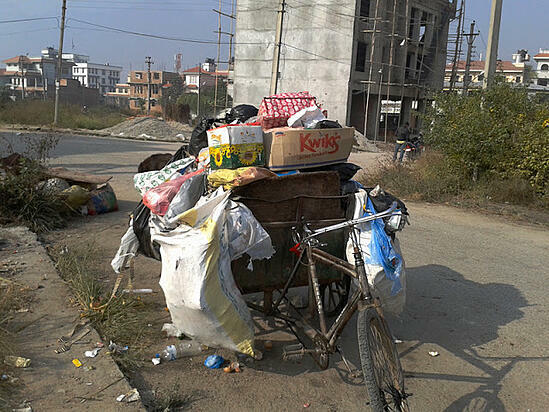 When we first moved to Nepal my wife was adamant about recycling everything because we did not want to add to the country's growing trash problem. Then we came to realize that the garbage collectors really were in the recycling business and they hand sort everything to gather whatever they can sell for recycling and get a few rupees. 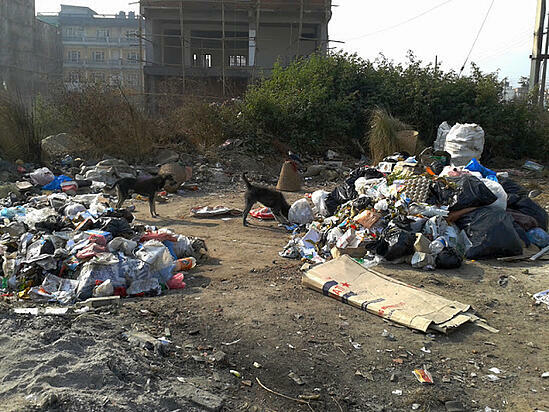 Our management team has been working with the local community association to see if we can help find another place for the garbage sorting so we can actually build a nice little public area there, which was the original intent and plan for the area. But beyond this we realized it was time to get out and serve the community again. We have cleaned and painted a local park, planted some trees and did community cleanups in the past but this time was different. Our new community service coordinator planned things out better than I ever have and was able to get 6 or 7 other community businesses and organizations to join us in the effort. We had people from the local bank, community association, supermarket, a brick factory, the local rotary club, a women's coop and from a youth center in our area. We divided everyone into five teams all named after the major lakes in Nepal (Begnas, Phewa, Rara and Tilicho) and handed out shovels, brooms, hoes, and other tools to help with the 3 foot weeds, bushes and garbage all over our neighborhood. We had prizes for the top teams and individuals, and a local lady famous for her amazing momos (steamed chicken dumplings) came to help our 2 kitchen staff make over 700 momos for everyone afterwards. There were over 50 really tired, hungry and dirty people at the end but also a deep sense of satisfaction. Looking out the window today we only made a small dent. But we did make a difference. There were many from the community walking by and asking what we were doing and why we were doing it. I trust that next time we will have even more people join in. As one of the biggest companies in our area we are honored to take the lead in making small steps towards change. You have to start somewhere, you have to start small and focusing on ourselves and our own backyard feels like a step forward in our bigger dreams and plans as CloudFactory.